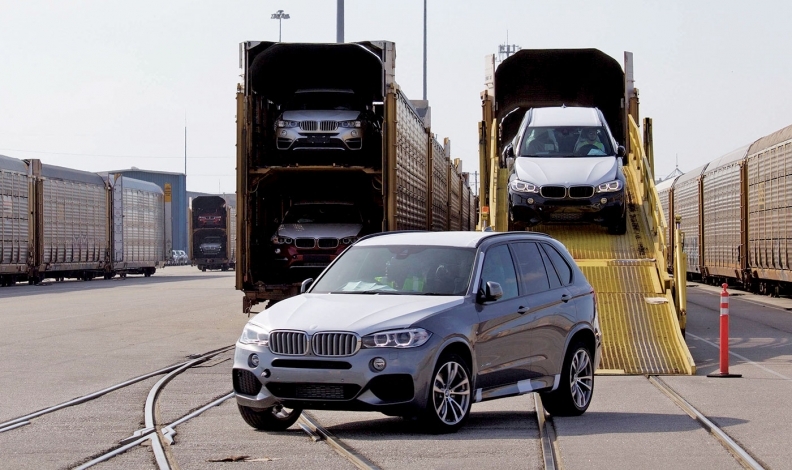 BMWs are unloaded from a train at the Port of Charleston, South Carolina. FRANKFURT -- BMW is considering building more crossovers in China as tariffs between the United States and China are expected to dent the automaker's 2018 earnings by 300 million euros ($344 million), Chief Financial Officer Nicolas Peter said on Wednesday. "We will take a final decision in the coming weeks about which model to localize next in China," Peter said, adding that sales of the X3 SUV have risen since BMW decided to build it in Asia, cutting its reliance on exports from the U.S. It was unclear if building more crossovers in China would affect jobs and investment at BMW's U.S. manufacturing operation in Spartanburg, South Carolina, the company's largest assembly plant in the world. "If the tariffs undermine the competitiveness of BMW production and sales in the U.S., the result could be strongly reduced export volumes with negative effects on investments and jobs in the U.S.," according to BMW spokesman Kenn Sparks. BMW currently makes its X3, X4, X5, X6 and X7 crossovers in Spartanburg, but the trade dispute with China has added pressure to move production of volume sellers like the X5 to China, which currently levies a tariff of 40 percent on vehicles imported from the U.S.
BMW this year stopped exporting the X3 from the U.S. to China amid the escalating trade row, moving production to a plant in Rosslyn, South Africa, and another in Shenyang, China. In October, BMW said it would spend $4.2 billion to take control of its main joint venture in China. The move was expected to spur BMW to shift more production to China, helping to protect profits amid the U.S.-China trade battle that has raised the cost for BMW in China to import cars made at its South Carolina plant. The Spartanburg plant last year built more than 370,000 crossovers, of which more than 270,000 were exported to China and other global markets. Production is expected to be about the same this year, with increased U.S. demand helping to offset a drop in exports. The plant will be the sole source for the new X7 flagship, which goes into production in December.